The research, conducted by a team of scientists at the Department of Energy's Lawrence Berkeley National Laboratory (Berkeley Lab), could lead to new innovations in linking proteins to other materials for bio-based electronic devices – such as sensors that can diagnose disease or detect contaminants. It could also help researchers to understand and control the chemical reactions sparked by these protein-material interactions. "Moving electrons to metals can cause different minerals to grow or dissolve. Studying how a protein does this can help us understand both how organisms remodel their environment and make biominerals for teeth or protection," said Caroline Ajo-Franklin, a staff scientist in the Biological Nanostructures Facility at Berkeley Lab's Molecular Foundry, which is a nanoscience research center. "Understanding what these interactions between proteins and materials look like can help us design them better," she added, "and give us insight on how to connect living cells with devices." Researchers relied on an X-ray-based technique at Berkeley Lab's Advanced Light Source, known as "footprinting," to pinpoint the chemical connections between the bacterial protein and nanoparticles composed of iron and oxygen. The study, which identified a surprisingly small and weak binding site, also benefited from tools and expertise at the Lab's Molecular Foundry; and the Lab-led Joint BioEnergy Institute, which specializes in biofuels research. The structure of this exotic protein had been previously mapped in isolation with atomic-scale detail by other research groups using X-ray crystallography, which required a crystallized form of the protein. But scientists didn't know how it bound to the metal-containing mineral – conventional techniques can't see this binding process. In 2014, Ajo-Franklin learned from Corie Ralston, another Lab researcher who works in the Molecular Biophysics and Integrated Bioimaging (MBIB) Division, about the X-ray mass spectrometry footprinting technique, an innovative way to precisely probe proteins and their surroundings with X-rays at the Advanced Light Source. Ralston had adopted the X-ray footprinting technique from her former advisor, Mark Chance, a professor at Case Western Reserve University who established the X-ray footprinting technique at Brookhaven National Laboratory on Long Island, N.Y. This X-ray technique is only available at the ALS and Brookhaven's National Synchrotron Light Source II (NSLS-II). "Footprinting can tell you how proteins are interacting," Ralston said. "It can provide structural and dynamics information about proteins in close to their native environment." The protein selected for the study is from a metal-reducing bacterium, Shewanella oneidensis, which "eats sugar and basically breathes minerals" when oxygen is unavailable, Ajo-Franklin noted. "One of the reason these organisms are so much fun to study is that they interact with a wide range of materials." After Tatsuya Fukushima, a former Lab scientist who was a co-lead author of the study, found a suitable way to prepare the protein and nanoparticles in a liquid solution for X-ray studies, Sayan Gupta, an X-ray footprinting expert in Berkeley Lab's MBIB Division, used an X-ray beamline at the Advanced Light Source to study the samples. "We are catching the snapshots of the state of this molecule at a particular time," Gupta said. "It's a simple technique and gives you lots of information about a protein's native state." "The biggest finding, that was quite surprising, was that our proteins bind relatively weakly," Ajo-Franklin said. "Most proteins that interface with materials bind really tightly," changing shape as they form this connection. 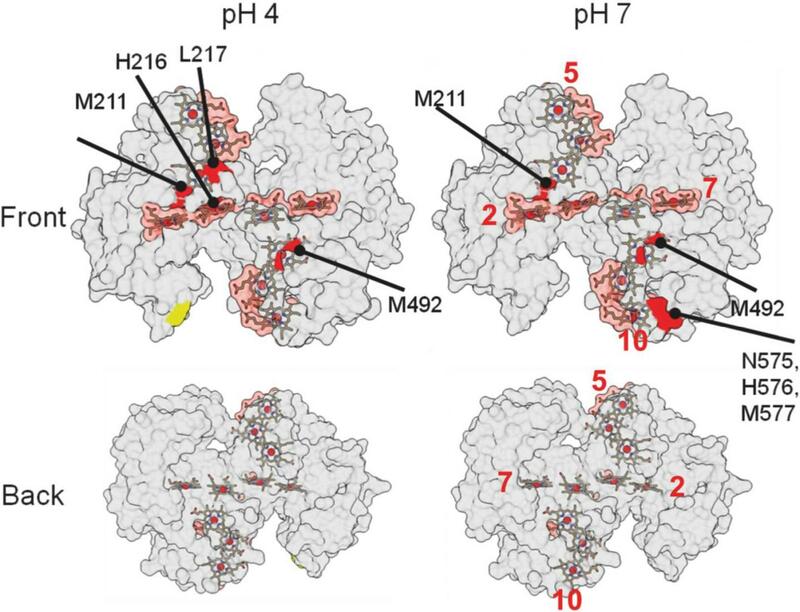 This particular protein doesn't appear to change shape at all and only interacts with the mineral in a small area, requiring about five times less binding energy, by comparison, than typical proteins that form biominerals. That actually makes a lot of sense, she added. "The job of this protein is to transfer electrons to the mineral, so it doesn't have to be in contact for very long." "There are a bunch of proteins in this family," Ajo-Franklin said. "We are really excited to see how these proteins interact with different materials. Do they all use the same binding strategy?" The Molecular Foundry, Advanced Light Source, and National Synchrotron Light Source II are DOE Office of Science User Facilities that are available to staff and visiting scientists from the global scientific community. The work was supported by the DOE Office of Basic Energy Sciences and by the DOE's Lab Directed Research and Development program. Find out more about Caroline Ajo-Franklin's research: http://cafgroup.lbl.gov/.